I use Braggs brand and the cheapest place (I’ve found) to purchase this magic gold dust is from Vitacost.com. If you’re new to Vitacost, sign up here and get $10 off your first purchase! They also offer free shipping $49 and over! If you remember in one of my earlier posts about my Reese’s PB Chocolate Shake, Vitacost is where I purchase my Peanut Plus Flour too! I also buy my Braggs Apple Cider Vinegar from Vitacost. Have to have my Cherry Limeade Refresher EVERY day! ANYway, apologies, I get excited about shopping at Vitacost (love their prices!) Hehe:) Ok back to the cheese crackers. 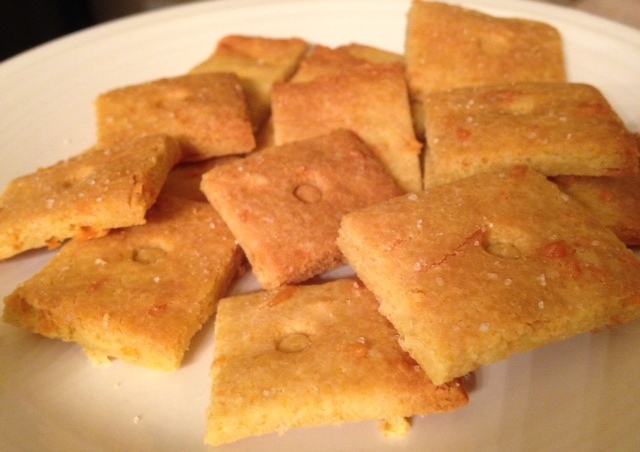 So this recipe was invented by Whole New Mom and oooh Mom, I just can’t thank you enough!! You. R. Genius. See the original recipe here and my version below. These are perfect for a snack by themselves or with Laughing Cow Cheese or as a side with lunch. Awesome source of protein and nutrients!! Sometimes I will reheat them in my little oven for about 3-5 minutes to get them crispy again. SO good! Start by making the dough in a bowl, just mix everything together. 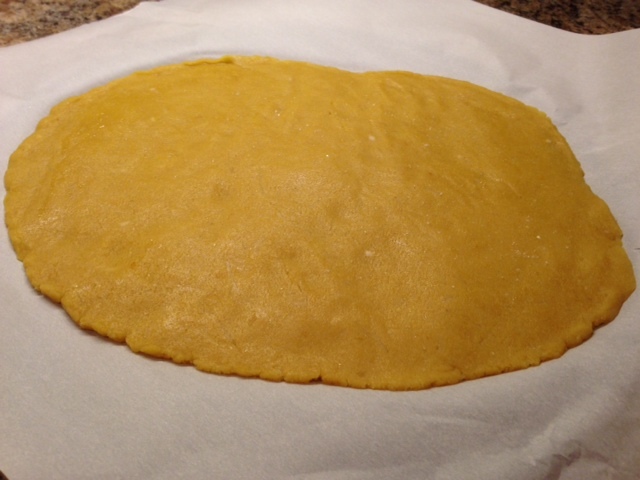 Then roll out onto parchment paper and flatten by using parchment on top. 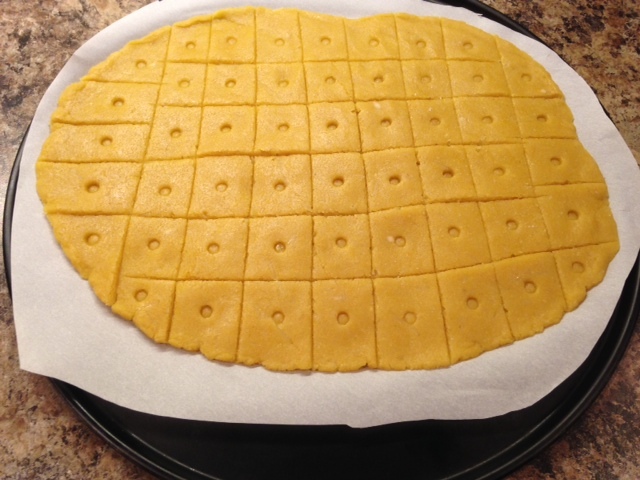 Next, slice into squares/rectangles with a pizza slicer. 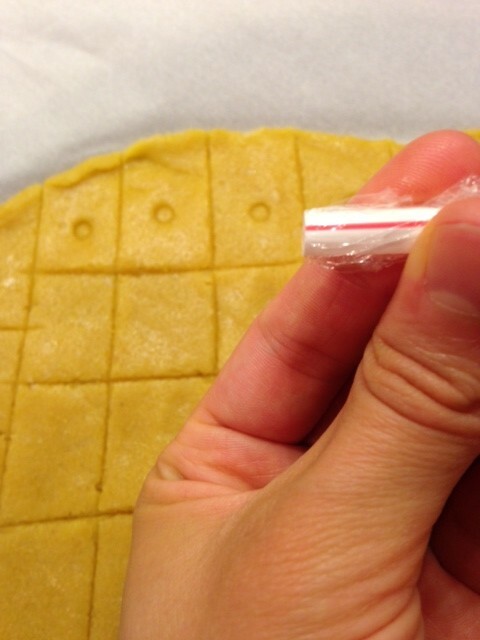 Then, I found a way to make a cute little hole design by taking a straw and placing plastic wrap over the bottom, then gently press on each square! Next using scissors, cut off excess parchment paper. Sprinkle with sea salt then they’re ready to go in the oven! 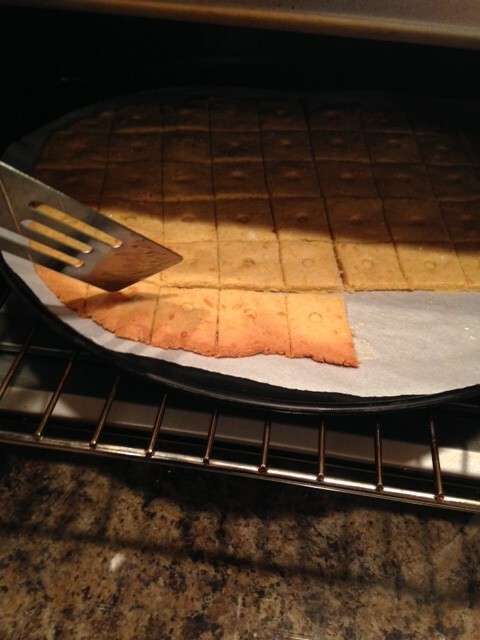 After about 10 minutes of baking if the edges start to brown, using a spatula, cut out the outer pieces and put them on a plate to cool, then continue baking the rest of the crackers. Plate to cool then devour! Just a note: I’ve not experimented with any other flours or ingredients, so I’m not sure how it would taste with different ingredients! Feel free to experiment though! Melt butter in a large glass bowl. Mix in egg and lemon juice. 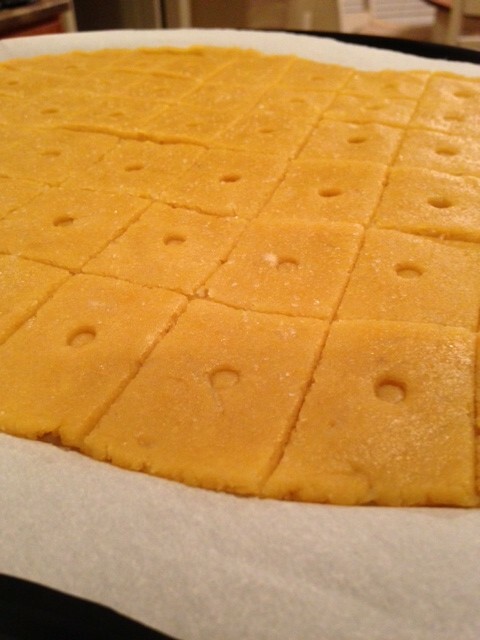 Add almond flour, nutritional yeast, parmesan cheese and sea salt. Place dough on parchment paper and with another sheet of parchment paper on top, flatten out dough. 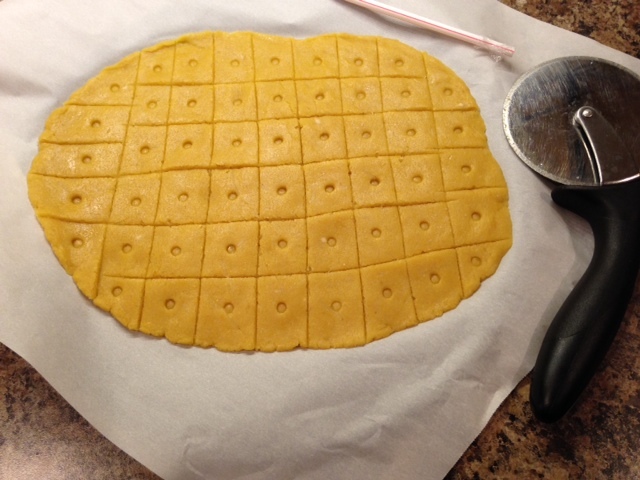 Slice into desired shapes using a pizza slicer or knife. 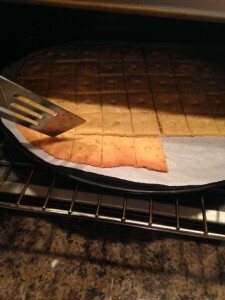 Bake (on parchment paper on a pan) 350 for about 10 minutes, check and remove any golden brown edge pieces. Bake for another 3-5 minutes or until golden brown, checking so they don't overcook. Store in a ziplock or sealed container in the pantry. 🙂 No need to refrigerate. Use a straw with plastic wrap over the end of the straw if you want a little hole in the center of each cracker. 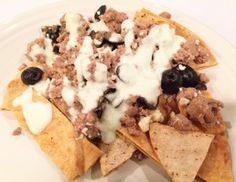 This entry was posted in Bread, Lunch Ideas, Sides, Snacks, THM. ← Great Price on Cauliflower! Thank you thank you thank you for sharing this! These are amazing!! 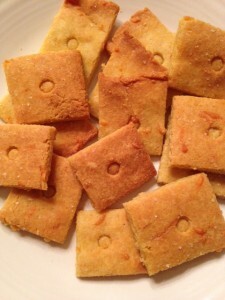 I have been longing for a cheesy cracker just like this- it is really hard to find a THM approved one that works! My baby girl loves them, too. 🙂 Thanks again! Thank you so much for this recipe! I’m just making it the second time. The first time I brought it to a baby shower where there were a lot of THMers & it was a hit! How did you get that lovely orange color? Mine are yummy, but not crispy enough. Putting them back in for a few minutes. Hope it works since they’ve already cooled. They did crisp up some more and they are yummy, but still not that pretty orange color. Hi Jacque! I think sometimes it depends on the oven. If you leave them in longer, they should turn a darker color, not necessarily orange though. It may be the lighting in my picture! The main objective is to get a crunchy cracker! If I have leftovers, I will stick them back in the oven for a few minutes to crisp up again the next day. I hope you enjoy them! So happy to hear everyone loved them! It’s a favorite around here for sure. Does anyone know how many would be a serving for THM? What kind of nutritional yeast – powder or flakes? That’s a great idea Mary! Did you bake the crust at all before adding the filling then bake again with the filling? How did it turn out? Absolutely delicious!! Thank you! Too bad my kids love these too – none left to save :)!Chips and crackers have been drawing me off of thm, so these will be my new secret weapon! !